Bluegreen Vacations (BXG) completed its IPO in November 2017. The company had been wholly-owned by BBX Capital (BBX). In the IPO, Bluegreen offered a total of 7.47 million shares (including, with the overallotment option, 3.74 million shares owned by BBX Capital) at a price of $14 share. Net of underwriting discounts, commissions and other expenses, the offering raised an estimated $95.8 million, of which $47.2 million was received by Bluegreen, the rest by BBX. On a pro forma basis (as of Sept. 30, 2017), the offering raised Bluegreen’s cash position to $171 million and its equity book value to $315.7 million. Bluegreen intends to use the proceeds for general corporate purposes, including increasing working capital, making acquisitions and developing new properties. 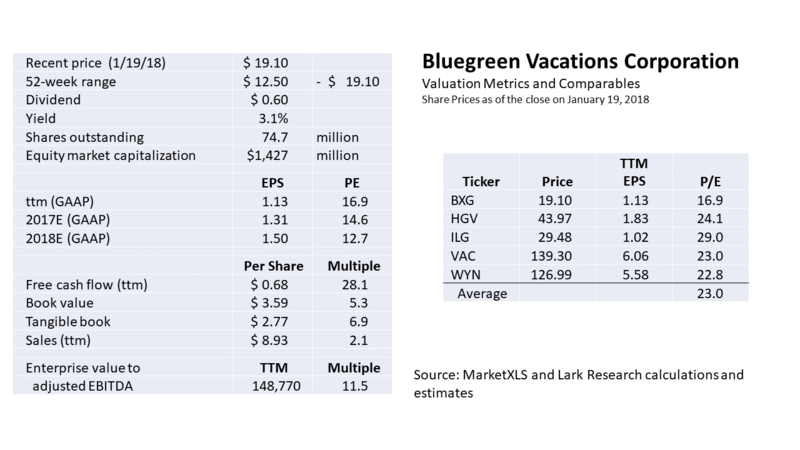 Bluegreen sells vacation ownership interests (VOIs) (aka timeshares) and manages resort properties. Its network includes 67 resorts located in both popular and slightly off-beat vacation locations, such as Orlando, Las Vegas, Myrtle Beach and Charleston, as well as Boynes Falls, MI and Wisconsin Dells, WI. These resorts are considered primarily “drive to” locations. 85% of its vacation owners live within 300 miles of a Bluegreen resort and 70% drive to their Bluegreen vacation destinations. Bluegreen has 43 Club Resorts and 24 Club Associate Resorts. It manages all the Club Resorts, but only five of the Club Associate Resorts. Bluegreen Vacation Club owners can therefore use most of their vacation points at Club Resorts, but they are limited in their ability to use vacation points at Club Associate Resorts. Up until 2009, Bluegreen’s business focused solely on the sale of VOIs in its own proprietary resorts (i.e. those that it had either developed or acquired). Since then, the company has expanded its offerings of VOIs of third-party properties. Under this “capital-light” operating model, Bluegreen can generate commissions on the sale of VOIs or purchase the VOIs on a just-in-time basis (i.e. immediately before closing). In some cases, the company operates these properties, as well. In the 12 months ended Sept. 30, 2017, 67% of Bluegreen’s revenues came from capital-light activities, including VOI sales and fee-based commissions and management and other fee-based services. Bluegreen has expanded its capital-light offerings by forming strategic alliances or joint ventures with RCI (www.rci.com) (an affiliate of Wyndham Corporation), Choice Hotels, Bass Pro Shops, Tanger Outlets and Shell Vacation Clubs, among others. With the travel-related companies, Bluegreen’s alliances allow its Vacation Club members to stay at its partners’ hotels and resorts and/or purchase at a discount other vacation-related experiences (e.g. cruises, restaurant meals, rental cars, etc.). Retail alliances allow Bluegreen to maintain kiosks and/or distribute brochures and sign consumers up for resort tours. Bluegreen also owns a 51% interest in Bluegreen/Big Cedar Vacations, a joint venture with Bass Pro Shops, which offers VOIs from three wilderness-themed resorts located near Table Rock Lake in the Ozark Mountains of Missouri. The company is also hoping to add to its marketing locations (and conceivably expand its resort network out West), if Bass completes its proposed acquisition of Cabela’s. A Typical Bluegreen VOI. The typical VOI transaction for a Bluegreen owner currently averages $15,000 for a fixed number of annual vacation points. (I am guessing somewhere between 5,000 and 10,000 points, which equates to $2.00-$3.00 per point). Owners use points to stay at Bluegreen’s resorts (or those of its partners) each year. The number of points required for each stay varies based upon the popularity of the resort, the length of stay, size and location of the room and the timing of the stay (i.e. peak season vs. off-peak, weekday vs. weekend)). According to Bluegreen’s website, 5,000 points will get a VOI owner a 4-7-night stay in a 1 or 2 bedroom suite, cabin or villa at many of its resorts. Owners can, to a limited extent, carry over unused points to the following year or borrow points from next year’s allocation. Bluegreen Vacation Club owners pay $139 in annual dues and many pay an additional $59 annually for its Optional Traveler Plus Program (that gives them access to other travel networks). Vacation Club owners are also required to pay an annual maintenance fee to cover upkeep of its resorts (including operating expenses and capital expenditures). Under the traditional operating model, a timeshare owner gets a deeded interest entitling him (or her) to use a specific vacation property unit for a specified period at specified dates each year (e.g. one week from Feb. 4 to Feb. 10 each year). In addition to the purchase cost, the timeshare owner is required to cover his or her share of the cost of maintaining and operating the facility, including repairs and upgrades. If the owner defaults on his or her maintenance obligation (apparently not an infrequent occurrence), the homeowners’ association (HOA) of that resort will foreclose on his VOI. Bluegreen will usually then buy the timeshare interest at a huge discount (equal to 95% of the property’s estimated retail value in recent years) and resell it. The shift from traditional VOI sales to the new capital-light model has accelerated in recent quarters. On a rolling 12-month basis, traditional VOI sales declined by 50% from March to September, while equity trade allowances, given to existing owners who are seeking more vacation purchasing power or to cover the cost of inflation, dropped by 40% over the same period. Offsetting those declines have been increases in secondary market program VOI sales (i.e. sales of HOA foreclosures or existing VOIs from third parties) and sales commissions on third-party VOIs (including HOA VOIs). Bluegreen’s Business Model. VOIs are typically sold at high profit margins. Much of that margin is used to cover selling and marketing expense, which accounts for slightly more than 50% of total system-wide VOI sales, and defaults on VOI financing contracts, which also are high. In 2015, Bluegreen became aware of an industry trend in which lawyers representing VOI owners who were delinquent on their financing obligations issued “cease and desist” letters to stop collection efforts. After receiving such letters, Bluegreen has taken the position that it cannot contact these delinquent owners “unless allowed by law.” The company suspects that these attorney actions have encouraged some VOI owners to default on their obligations. Bluegreen has pursued legal action against some of these VOI owners and may pursue similar actions in the future. Bluegreen’s average annual default rate on notes receivable has increased from 6.9% in 2015 to 8.1% for the twelve-month period ended September 30, 2017. Although delinquency rates increased from 2.9% at Sept. 30, 2016 to 3.1% at Sept. 30, 2017, the Sept. 2017 delinquency rate is still slightly below the 3.3% rate reported at year-end 2016 and 2017. VOI Purchase Terms. Bluegreen will finance up to 90% of the VOI purchase price for an average term of 10 years. During 2016, the weighted average interest rate on Bluegreen’s outstanding notes receivable was 15.7%. At that rate, a 10-year, $13,500 loan will require payments of just under $225 per month. According to Bluegreen, the average borrower has a FICO score of 712 and Bluegreen does not generally provide financing to purchasers whose FICO scores are below 575. The company ignores the FICO score, if the borrower makes a downpayment of 20% or more. Bluegreen provides incentives to its salespeople to encourage prospective buyers to put down more cash. In 2016, 41% of system-wide sales of Bluegreen’s VOIs were paid in cash (within 30 days of purchase). Bluegreen says that its average customer has a household income of $75,000, below the industry average of $90,000. Over the two years ended Dec. 31, 2016, 28% of its VOI purchasers were millennials and 34% were Gen Xers. The average age of a Vacation Club owner is 48; with more than 25% younger than 44. Bluegreen’s “drive-to” resorts are well suited to these customer demographics. Yet, the company routinely scales its VOI packages to match the financial abilities of prospective customers. Slow Growth in Total VOI Owners, But High Churn. Bluegreen’s Vacation Club has grown its owner base at a compounded annual rate of 3.7% from 170,000 at Dec. 31, 2012 to 211,000 at Sept. 30, 2017. Over the past few years, Bluegreen has added roughly 24,000 new Vacation Club members annually, equal to about 12% of the beginning year total. That implies that Bluegreen has been losing about 15,000 members annually (mostly through defaults on financing contracts or membership dues), equal to about 8% of the beginning year total. Thus, membership churn is significant, requiring Bluegreen to maintain a strong sales and marketing effort to sustain and grow its net Vacation Club membership. The sales and marketing effort is obviously key to Bluegreen’s business. Selling and marketing expense routinely accounts for just above 50% of system-wide VOI sales (i.e. the implied retail value of all sales, including those upon which Bluegreen earns a commission). Thus, $1 in selling and marketing costs typically generates about $2 in system-wide VOI sales. Bluegreen’s sales and marketing effort is wide-ranging. Besides maintaining a marketing presence through its strategic alliances – e.g. kiosks in Bass Pro Shops and inclusion of selected Bluegreen resorts in Choice Hotels’ upscale Ascend Collection – Bluegreen conducts more than 250,000 tours of its resorts annually. (256,584 took the tour in the 12 months ended Sept. 30, 2017.) In recent years, just under 16% of those taking a Bluegreen tour end up purchasing a VOI. Roughly two-thirds of those taking a tour and just over half of those purchasing a VOI are new to Bluegreen. It is not difficult to find consumer complaints about Bluegreen. One website gives Bluegreen an average rating of between one and two stars (out of five) based upon 90 or so reviews. 21 reviewers on that site rated the company five stars; while ten rated it four stars. While I did not systematically categorize the reviews, most of those who rated the company poorly were either potential owners who said that Bluegreen did not live up to its promises on the discounted vacation packages that they purchased (in exchange for attending a sales presentation) or applied undue pressure to get them to sign a contract. The rest were actual owners who complained about being “suckered” into buying a VOI or how difficult it was to get out of the contract. Those who rated the company highly most often seemed to be frequent vacationers who learned to navigate Bluegreen’s system by making reservations well in advance and/or choosing off-peak times for their vacations. For what it’s worth, the other timeshare companies on this website were similarly rated. Securitized Notes Receivable. On financed VOI sales, Bluegreen collects an average downpayment of 10% or $1,500 against the average purchase price of $15,000. Its marketing cost, however, is about $7,500, so it would face a cash deficit of $6,000 on each financed sale were it not for its ability to securitize the note receivable of $13,500 that it generates on the sale. Advance rates on securitized notes receivable have recently averaged between 85%-90%. Financings backed by notes receivable are usually done on a non-recourse basis. Thus, the availability of (non-recourse) financing is a key aspect of its business model. Without it, Bluegreen would have to scale down its business considerably. While the advance rates on non-recourse securitized notes receivable seem high, given the high default rates, the receivables-backed debt is well covered by the wide spread between the interest earned on the receivables and interest paid on the debt. (In the 2017 Term Securitization, the average interest rate on debt was 3.12%.) That wide spread allows the special purpose financing vehicles that manage the receivables and service the debt to compensate for the high default rates. For accounting purposes, Bluegreen has been maintaining a loan loss reserve equal to 21% of gross notes receivables outstanding. At year-end 2017, total receivables-backed debt outstanding equaled 81% of pledged notes receivable, according to my calculations. Bluegreen was in compliance with the applicable terms of the securitizations through Dec. 31, 2017 and no triggering events, which would result in accelerated payments to debtholders of amounts received on the notes receivable, had occurred. Under the terms of these securitizations, Bluegreen has the right to substitute a limited amount of new notes receivable for defaulted notes receivable. These voluntary substitutions totaled $3.3 million in 2015, $6.5 million in 2016 and $9.5 million in 2017. Bluegreen typically completes one (non-recourse) securitization each year. In the 12 months leading up to that securitization, the company relies on recourse bank credit lines, secured by notes receivable, to finance its operations. After the securitization is completed, the bank lines are repaid and the cycle begins again. Debt-to-Total Capitalization. Besides the receivables-backed debt, Bluegreen had $95.6 million of unsecured notes payable and $70.1 million of junior subordinated debentures outstanding. Total debt outstanding at Sept. 30 was therefore $631.3 million. Non-controlling interests, which consist entirely of Bass Pro Shops’ 49% interest in Bluegreen/Big Cedar Vacations, were $46.3 million and the book value of Bluegreen’s Common Equity was $268.5 million. It is possible to draw different conclusions about the degree of leverage that Bluegreen employs depending upon whether the non-recourse debt is included in the calculation. Since that debt is non-recourse, it can likely be ignored in a liquidation analysis. Some analysts might also exclude it on a going concern basis; however, it is important to remember that securitizations are an important source of cash flow for the company; so it is unlikely that Bluegreen can simply walk away from these obligations, even though they are non-recourse. Adjusted EBITDA. Bluegreen uses adjusted EBITDA as a financial performance measure. Its definition excludes only corporate and other interest expense. Likewise, it eliminates all interest income, except for the interest earned on notes receivable. Thus, its definition of adjusted EBITDA includes only the spread earned on notes receivable (interest income minus interest expense). Bluegreen’s EBITDA, calculated in the traditional way – i.e. adding back total interest expense (and leaving in interest income earned on the notes receivable) – is significantly higher. Bluegreen’s adjusted EBITDA methodology includes essentially only the profit earned on notes receivable. It treats its notes receivable securitizations as a financing business, which is appropriate. (For obvious reasons, finance businesses do not use EBITDA as a metric). Bluegreen’s policy is further justified by the fact that most of the notes receivable related debt is non-recourse. 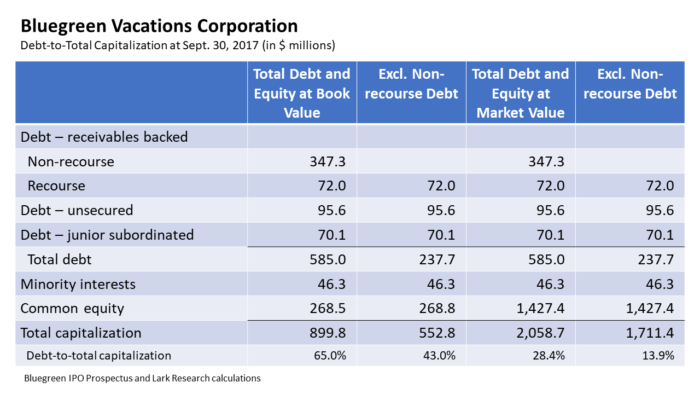 Yet, investors should not completely ignore the traditional EBITDA-based metrics and performance measures because of the importance of securitizations to Bluegreen’s business model. Financial Performance. Despite the relatively rapid turnover and modest net growth in its membership base, Bluegreen has grown, with some pauses, since the tail end of the financial crisis in 2009. In recent years, the company has delivered mid-single-digit growth in revenues and adjusted EBITDA. Both the VOI business (including related financing income) and the Resort Operations and Club Management business have grown over the past two years. For the 2017 nine-month period ended Sept. 30, 2017, revenues rose 0.9% to $501 million, while net income attributable to Bluegreen surged nearly 20% to $59.1 million. Adjusted EBITDA was up 10.7% to $113.0 million. A sharp decline in sales of VOI was more than offset by a jump in fee-based sales commission revenues. Bluegreen earned about $2 million more from other fee based services and its SG&A expenses fell by $8 million (reflecting a 220 basis point drop in the SG&A expense ratio to 61.6%). Pro forma for the IPO, Bluegreen’s EPS increased from $0.66 to $0.79. The results reflected especially strong second quarter performance. Third quarter revenues declined 0.5% to $180.2 million and adjusted EBITDA slipped 5.9% to $39 million. As a result, I am expecting Bluegreen’s pro forma 2017 fourth quarter EPS (excluding the tax gain) to decline modestly from $0.34 to $0.30 on flat revenues. For the full year, that translates into GAAP EPS of $1.31 and adjusted EPS of $1.09. For 2018, I am currently assuming a 1.4% increase in revenues to $676 million and EPS of $1.50 (at a 21% tax rate). That would represent a 14.5% increase over projected 2017 GAAP EPS of $1.31. Excluding the tax cut, I project that EPS will rise by 11.9% from $1.09 to $1.22. Management is pursuing three levers to grow the business: product and geographic expansion, new customer growth and process improvements. As long as economic growth continues (or perhaps even accelerates a bit), the company should be able to grow its business, revenues and earnings. According to figures from EY (included in Bluegreen’s recent slide presentation), vacation ownership industry sales grew at a 7.2% compounded annual rate from 2012 to 2016. Bluegreen has reported that its system-wide VOI sales increased at a 7.5% annualized rate from 2014 to 2016; but only by 0.7% in the 2017 nine-month period. By all rights, with another year of industry-wide VOI sales growth and the deployment of the capital raised in the IPO, Bluegreen should be able to get its fair share of VOI industry sales in 2018 and beyond. Revenues, however, might grow at a slower pace, if the transition to a capital-light business model continues. Valuation. Shares of Bluegreen were issued at $14 in mid-November and have since traded up to a new high of $19.10 on Jan. 19. At that price, the stock is trading at 16.9 times trailing 12-month pro forma EPS of $1.13. By comparison, Bluegreen’s peers, including Hilton Grand Vacations (HGV), ILG (ILG), Marriott Vacations Worldwide (VAC) and Wyndham Worldwide (WYN), which owns both hotels and a timeshare business, are trading at an average of just under 25 times trailing 12-month EPS. The management of Bluegreen and BBX openly question why BXG trades at such a wide discount to its peer group, especially since BXG is among the few that have been able to achieve positive net owner growth over the past three years (2013 to 2016). I agree. 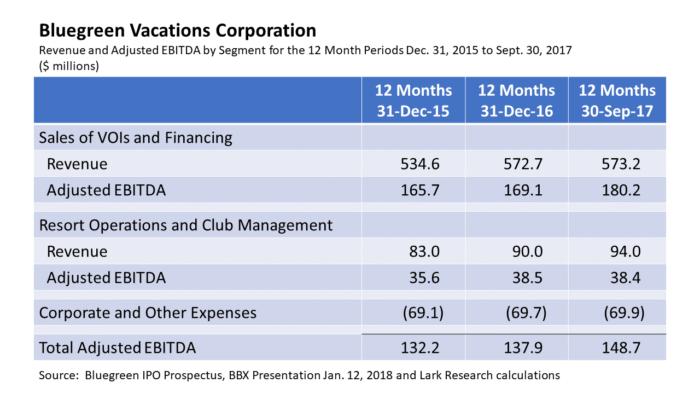 If the company is able to meet my 2018 projections, I expect that the valuation gap between BXG and its peers will narrow over the next 12 months. At current valuation levels, I have established a price target of $26-$29 on Bluegreen shares. In the meantime, Bluegreen has initiated a $0.60 annual dividend, good for a 3.1% dividend yield at the current quote. The average dividend yield of the peer group is 1.3%. Similar valuation arguments can be made for BBX Capital (BBX). The value of BBX’s 90% interest in Bluegreen plus cash on its balance sheet less outstanding debt is currently more than BBX’s equity market value. This suggests that the equity market is not assigning any value to BBX’s other businesses. BBX may be the subject of another post, perhaps at a later date. This entry was posted in BXG, Financials and tagged BBX Capital, Bluegreen Vacations, real estate, timeshare industry. Bookmark the permalink. 2 Responses to "Up Big Since the IPO, Bluegreen Shares Still Have Upside Potential"